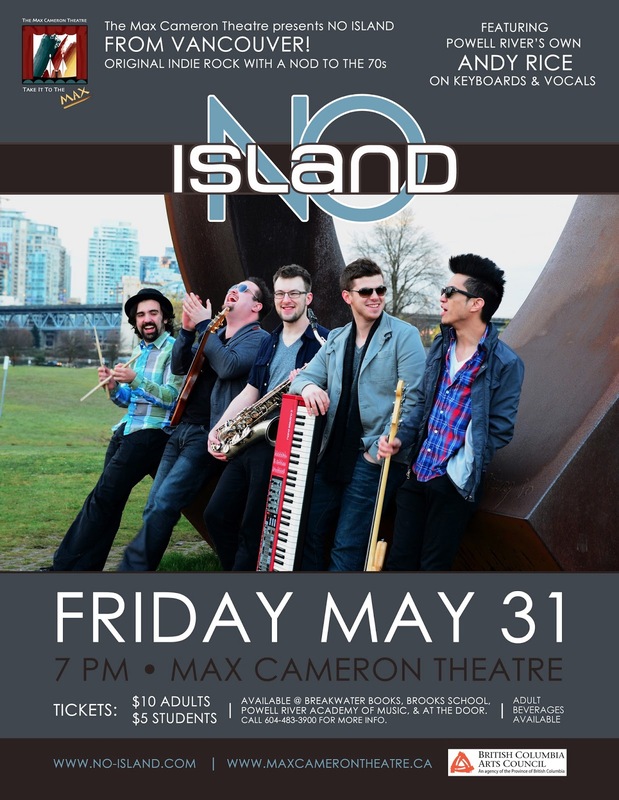 No Island - Latest Updates: Powell River Show Announced! Fri, May 31. Powell River Show Announced! Fri, May 31. I'm super happy to announce that we have a very exciting show lined up this May at the 400-seat Max Cameron Theatre in beautiful Powell River, British Columbia. That's the town I grew up in, and where I received an education in music throughout my childhood that undoubtedly shaped my life. The people there are amazingly supportive of the arts, and many of them have been asking me for years when No Island was going to finally make an appearance. Well, I'm happy to say that for our fans and supporters on the Sunshine Coast, the wait is over! Save the date for An Evening with No Island: Friday, May 31 at 7 pm. I should add that while it's an all ages show, alcoholic beverages will be available as well. We're planning out an evening that we hope will really showcase all of the music we've created since forming in 2009, even some of the songs we seldom or never get to play in the typical bar/club setting. The set is getting a lot of our attention in the coming weeks and we're really working hard to create a special night. I also have a 7-foot Yamaha C7 grand piano at my disposal (Fun fact: it's the same piano I took lessons as a kid) so I'm rather looking forward to that as well!